In situ Zircon content is based on direct analysis by XRF and back calculation only (ZrO2+HfO2/0.66). 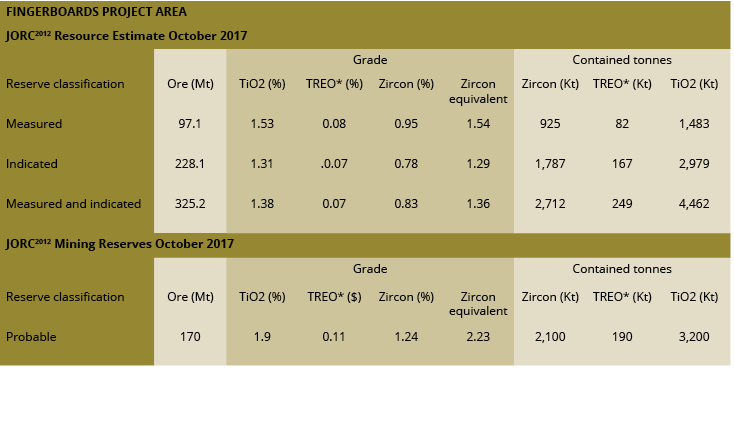 Zircon equivalent is calculated based on ZrO2/t, TiO2/t and REO/t pricing which is derived from the contained value of zircon (ZrO2), ilmenite, Hyti and rutile (TiO2) and monazite and xenotime (REO) in the Heavy Mineral Concentrate (HMC) sold to mineral processing companies in China and SE Asia. The values are calculated from final mineral product prices; and take into account mineral recoveries; product quality; and processing margins. As at 1 October 2017, prices used are USD$1450/t of contained ZrO2+HfO2, USD$200/t of contained TiO2 and USD$5000/t of contained REO+Y2O3. The metallurgical recovery to HMC for ZrO2+HfO2, REO+Y2O3 and TiO2 of depends on zone. The details are in the table below.